Britannica launches Curiosity Day, in celebration of its 250th birthday, with a series of curiosity-sparking activities for classrooms, families, and lifelong learners. Families can take the Britannica Curiosity Compass Quiz and discover their curiosity profiles and how they each navigate discovery. From the pages of Encyclopædia Britannica’s first edition in 1768—published out of an unassuming Edinburgh print shop by an engraver, a printer, and a hired scholar who shared the crazy notion that knowledge should be accessible to anyone—to the millions of daily visits to Britannica’s current digital reference universe, we’ve been changing the way the world learns for a quarter of a millennium. We’ve already discussed the idea that literacy is more than the ability to read physical words on a page, that “to be literate is to have an innate enjoyment of learning new things.” In the same vein, at the heart of every lifelong learner beats the same crucial trait—one that comes from a much deeper place than merely being “educated”: curiosity. We’re all born with our own inherent wonder at the world around us, but sometimes the business of education itself can get in the way of learning. Just like a muscle, curiosity needs to be stretched and strengthened—which is much easier said than done in the face of self-consciousness and standardized testing. So in honor of Britannica’s 250th birthday, we’re inviting classrooms around the world to join us in celebrating curiosity and the joy of learning with the following curiosity workout. The following activities work best when students sit in a circle where they can all see a smartboard and can have their own devices. Students know what anger, sadness, and happiness feel like, but do they know what curiosity feels like? Spend a few minutes talking about a feeling that students are familiar with so that you can then explore a potentially new feeling: curiosity. Let students know that today you’re going to talk about curiosity, being curious, and what it feels like to be curious. This activity sparks curiosity with an intriguing visual image and invites students to dive deeper by uncovering details, understanding context, and encouraging wonder. Then scaffold with question starters: Who, What, When, Where, Why? Extra Credit: Research the background of the photo, either as a class or on one’s own. Check back in with your students. How are they feeling? Have they noticed new feelings about being curious? Explain: Curiosity is a skill or a tool. Curiosity shows up in a lot of different places and a lot of different ways. There’s “school curiosity,” where your teachers give you some guidelines and help. Then there’s “real-world curiosity,” when it’s up to you to ask questions and find answers. What’s the question behind the question? This activity takes students to new places and perspectives by encouraging them to ask why. Pick one student to answer, then everyone asks “Why?”, and a second student provides an answer. Keep going until the class runs out of answers. Extra Credit: Break into small groups and keep playing, either with pre-written question starters or have students come up with their own on the spot. Secondary School Activity: What’s your curiosity personality? How were you feeling about yourself before taking the quiz? Proud, self-conscious, shy, confident? How about after? Do you agree with your results? In your mind, which current or historical figures fall into the different curiosity categories? Why? When is it important to be persistently curious about something? When is it not? Why? How does it make you feel when your questions go unanswered? What do you do about it? Have you ever noticed that little kids are really good at asking “why”? How many times can your students ask “why” about something? Stay tuned for more curiosity-evoking activities, tools, and content from Britannica as we jump into our year-long celebration of 250 years of curiosity and joyful discovery. 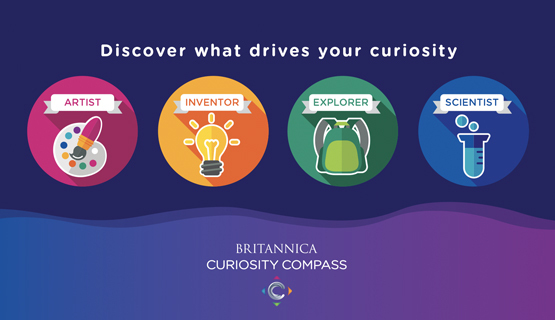 Share your Curiosity Compass profile results on social media (Twitter @Britannica_UK, Facebook: BritannicaUK) and see how your friends take on their curiosity.